Ever since the crisis in Kyrgyzstan began a few months ago, I’ve noticed a growing number of Central Asia “primer” events take place in the D.C. foreign policy scene. I feel it’s an attempt to catch people up on a region that receives little attention in mainstream media and has been set on the backburner of the U.S. foreign policy agenda since the end of the Cold War. Yes, they say we have a new threat greater than communism now: religious fundamentalism that springs acts of terrorism. And since the U.S. can’t carry all of the problems of the world, naturally, it can’t prioritize regions that are of lesser interest to our immediate needs. Experts at the Atlantic Council argue, however, that Central Asia is key to U.S. interests in “winning” in Afghanistan and maintaining peace in the region. “It is of the opinion of many that this region will play a significant role in 21st Century relationships. It represents both a threat and tremendous opportunity,” said Senator Chuck Hagel, the chairman of the Atlantic Council. President of the Atlantic Council, Fred Kempe, pointed to the fact that the U.S. was much more engaged with the region in the 90s. “We were right to focus on it then, and we’re wrong not to now,” he said. “We need to care for the reasons Sec. James Baker went around to the former Soviet Union in 1991. We were determined never again would our way of life be threatened by a Central Asian country,” said Ambassador Ross Wilson, who was also on the panel. He has also served as an Ambassador to Turkey and Azerbaijan. He went on to say that after 9/11, we lost touch with personal diplomacy and focused on military efforts, even in Afghanistan. Now that Kyrgyzstan is in a delicate position, he argues that it’s our responsibility to ensure a stable, democratic government can form. At the same time, who’s responsibility is it to seal the fate of Kyrgyzstan? The OSCE, led by Kazakstan? Uzbekistan? Russia? Or the people themselves? An audience member who is a professor at Georgetown University said there is a dire need for a public diplomacy agenda in the region, which would include trips to the area for non-crisis or military purposes. He said the State Department sent him to Kyrgyzstan in October and that was the first time in its 17 years of independence that a representative was sent to the country for public diplomacy. While the talk reflected many other talks I’ve heard recently, it did make me wonder if the U.S. would ever put Central Asia back on the forefront of foreign policy. The region is vital to our sustenance in Afghanistan (I’m sure they benefit financially from the war) and it is now a region “in transit” facing new political figures, acts of ethnic violence and religious fundamentalism. For highlights and a podcast of the event, go to the Atlantic Council site. Radio Free Europe and the International Crisis Group held a discussion yesterday on the state of Central Asia given recent turmoil in Kyrgyzstan and Uzbekistan. Speakers Daniel Kimmage, Eric McGlinchey and Paul Quinn-Judge discussed the issue to a full house of representatives from the Hill, State Department, international groups in the D.C. area and media. He said he hoped recent events in Central Asia have been eye openers to the U.S., who have called totalitarian leaders “diplomats” because we work with them. What we’ve seen happen in Kyrgyzstan recently is a series of events that has discomforted the United States. I would hope there’s going to be a little more humility in looking at our analyses of these countries in the future. 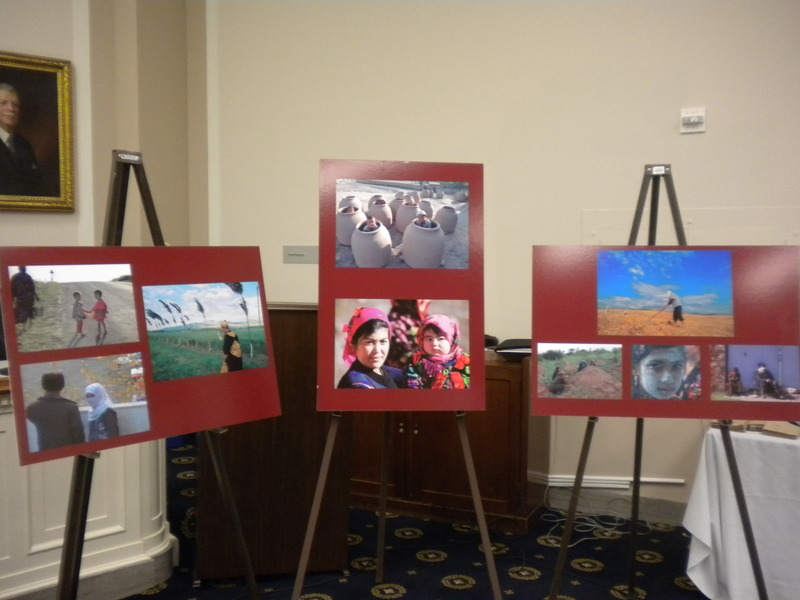 A journalist from Uzbekistan, who could not attend the event due to pressure from the government, provided RFE with vivid photos of poverty from the country that were on display at the event. “These countries by and large, at the top have governments and political systems that are dominated by political patronage, nepotism and corruption. At the bottom, they have weak civil societies and extremists,” he said. Panelists discussed the roll of Islamic extremism influencing unstable governments in Central Asia. Quinn-Judge said the subject of the U.S. comes up rarely because of how discreet the air base seems to be. China, on the other hand, causes great worry among the people because of its growing role in subsidizing their territory with natural resources. Kimmage said the U.S. needs to be more cautious before supporting authoritarian regimes in Central Asia because history shows they are unstable. Once new powers overthrow the authoritative governments, the people will then question the U.S.’s role in the area, which could compromise our interests. “We really need to call things by their real name. Don’t call dictators democrats just because they’re helping you out,” said Kimmage. The Trust Issue: How can the U.S. engage with Kyrgyzstan and its new opposition government? The National Security and Foreign Affairs subcommittee (of the Committee on Oversight and Government Reform) met for the hearing “Crisis in Kyrgyzstan: fuel, contracts and revolution along the afghan supply chain” last Thursday to discuss how the U.S. should engage with Kyrgyzstan after the overthrow of the Bakiyev government. The hearing tackled a broad range of topics from the U.S. military base in Kyrgyzstan, allegations of financial corruption tied to U.S. contractors and overall relations with the U.S. and Kyrgyzstan in terms of paving the way for democracy with the interim government. Kyrgyzstan has been a key ally in the U.S. and NATO’s military efforts in Afghanistan by serving as a hub and refueling station for US and NATO aircraft. They have used the base as a transferring point for over 50,000 soldiers and aide workers. Chairman John Tierney noted that many times in our history, the U.S. has overlooked corruption and human rights violations, as he called “unsavory regimes,” for bigger causes. We are left with the fact that both presidents were ousted from office and the U.S. has supported the two former regimes that fueled that corruption. The U.S. now has the delicate responsibility of establishing trust and credibility with the interim opposition government, who sees the U.S. as a supporter of the Bakiyev regime. Congressman Michael Turner said for 9 years, the base has helped U.S. efforts in Afghanistan, and he realized upon visiting Kyrgyzstan several years ago just how strategic its location is to the mission. But our relationship, he said, with Central Asia shouldn’t exist solely because of the base and we shouldn’t “pigeon hole” them into simply a channel to Afghanistan. Eugene Huskey, a professor at Stetson University, said the recent animosity towards the U.S. seen in Kyrgyzstan doesn’t reflect inherent anti-American sentiment, but rather, reflects popular frustration with leaders of the country selling its real estate to the highest foreign bidder. The U.S. might have to appeal to political parties in the upcoming election to maintain the base. Alexander Cooley, a professor at Barnard College, said the base has become a symbol of U.S. indifference toward Kyrgyz human rights and democracy and a daily reminder of what the old regime had become. Scott Horton pointed out two companies, Red Star and Minacorp that have been accused of fraud and bribery in Kyrgyzstan. According to a report from Eurasianet.org, the subcommittee will open an investigation into the Defense Department’s fuel contracting at the Manas Transit Center (the base) to determine if the companies had ties to the Bakiyev family. The subcommittee will also try to determine if the Pentagon, State Department or U.S. Embassy in Bishkek had prior knowledge of illegal activity. Cooley said a pro-base political candidate would only be able to run on the promise that he or she would keep the base but negotiate its legal provisions. “No one will get on board with business as usual,” he said.